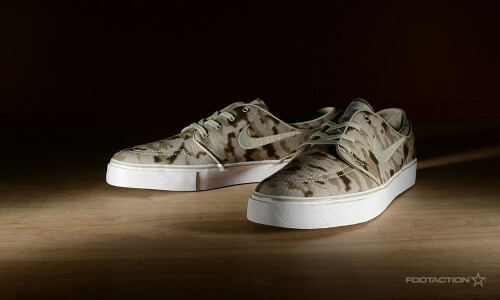 Following up on the success of other camouflage-inflected renditions like the Nike SB Janoski “Digi Floral Camo” and the Nike SB Zoom Janoski “Camo”, Nike SB releases the “Desert Camo” colorway of its Stefan Janoski pro-model silhouette. As one of the highest-selling shoes in the Nike SB stable, the sheer number of models released every year are a clear indication that they have no plans of slowing down. This sneaker particularly, dubbed the “Desert Camo,” combines tonal beige and brown across an airy canvas upper, perfectly weighted for the springtime. Featuring an original desert-toned camouflage print on the uppers, the sneaker is accented by beige Swoosh embroidery, shoelaces, piping on the foxing, and inner lining. Available in stores tomorrow. Check out Release Locator for stores. Print article This entry was posted by hhcblog on April 25, 2014 at 5:09 am, and is filed under Footwear. Follow any responses to this post through RSS 2.0. You can leave a response or trackback from your own site.